I really like making soup, but the weather has been so warm recently that I haven’t been able to bring myself to make any. Last weekend it finally started to cool down (and then quickly warmed up again, but that’s another story), and I was getting over a cold so I decided to make butternut squash soup for the first time. 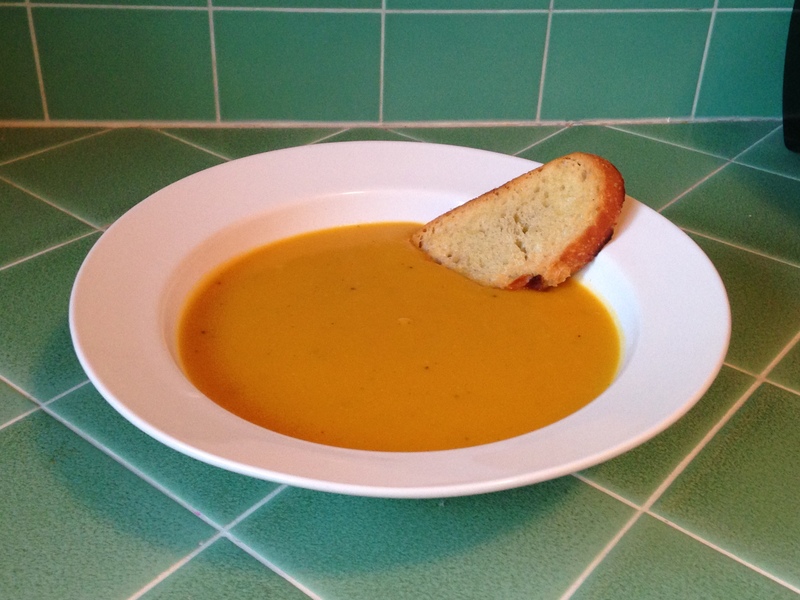 The hardest part about this soup is preparing the squash. You will need a very sharp knife and a good vegetable peeler in order to avoid a huge mess. Also, make sure the squash you pick does not have any cracks or bruises. 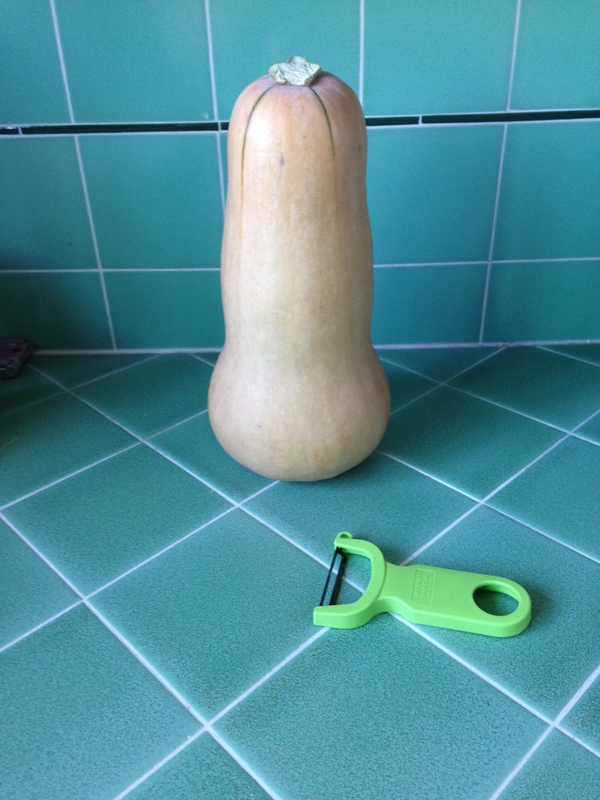 When I went to buy the squash on a Friday night I was in a hurry and didn’t check the squash. When I got it home I realized there were two big cracks in it so I had to drive back to Gelson’s and attempt to exchange it with another one, which was a bit of a hassle. I started off with just peeling the entire squash before cutting it apart. Some tutorials say to cut the squash first and then peel, but peeling was really not that difficult when I used the type of peeler pictured. When peeling the squash, it got super slimy so I held on to it with paper towels. Even though I sharpened my knife right before embarking on this endeavor, I found it was super difficult to cut the squash lengthwise without first cutting slices off the top. 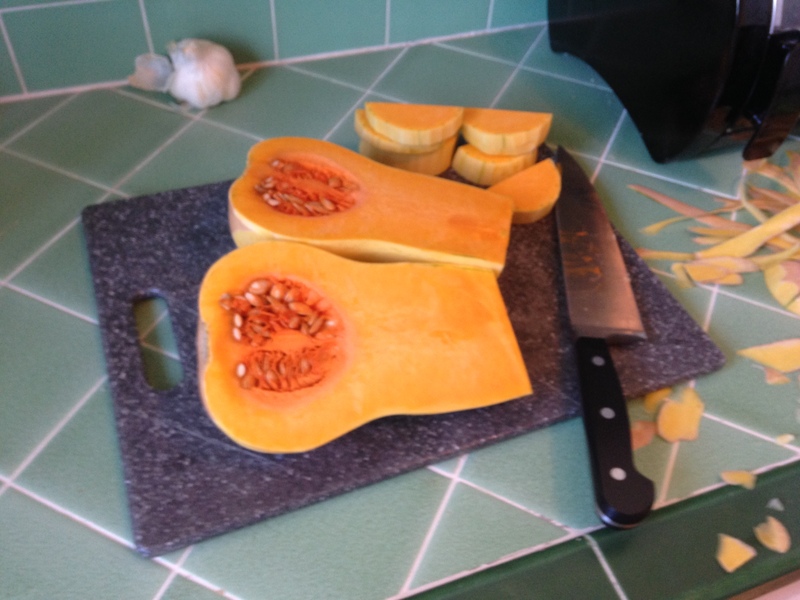 Once I got it to this state I scooped out the seeds with a spoon, just like you would when carving a pumpkin, and cut the squash into slices, and then cubes. 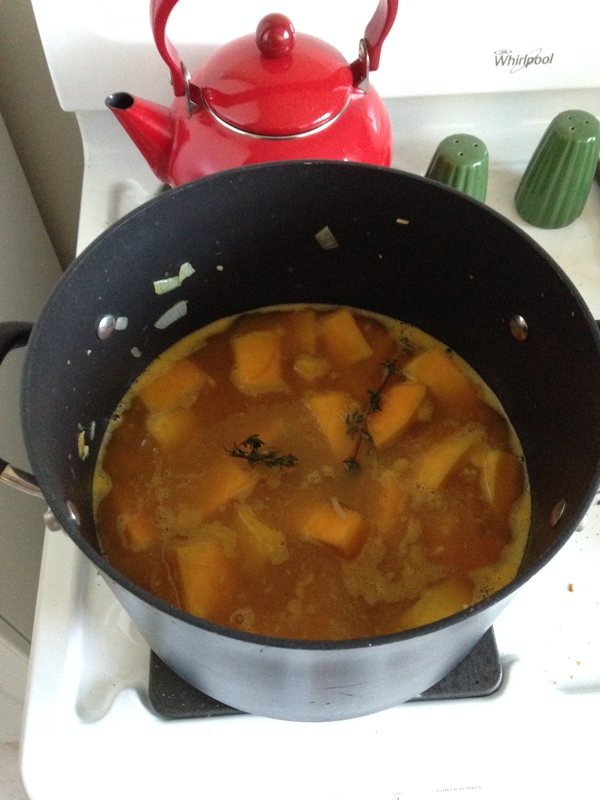 Bring to a boil and simmer, uncovered until the squash is fork tender (about 20-25 minutes). Remove the soup from heat and use an immersion blender to blend the soup until you reach the desired texture (remember to remove the thyme sprig before doing this). My soup was a bit thicker than I wanted so I just added a little bit of water until I got the right consistency. At this point, check for seasoning and season with salt and pepper if needed. If your stock was particularly salty you may not have to do much seasoning. If you don’t have an immersion blender you can blend the soup in batches in a regular blender or a food processor, but the immersion blender I have was very inexpensive and is way easier to clean than a regular blender or food processor. If you make soup, smoothies, or sauces on a semi-regular basis it is a good buy. I served my soup with a piece of bread that had been brushed with some olive oil and then toasted, which was very tasty. Let’s have an Oscar party!